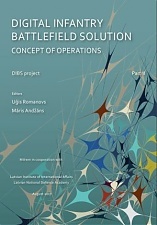 Estonian military industry company Milrem in cooperation with the Latvian Institute of International Affairs has published a new book, "Digital Infantry Battlefield Solution. Concept of Operations. Part Two", LETA was told at the institute. The institute’s representatives said that military conflicts have and will remain part of international affairs. Considering the cyclical nature of history, the possibility of new armed conflicts cannot be ruled out also in the Baltic region, but small countries are limited in their possibilities to defend themselves against adversaries with highly developed military capabilities. Military technology, however, can reduce this gap, the institute’s experts said. The use of unmanned ground vehicles (UGV) in infantry operations is one of the fastest developing areas of military technology. Progress in this area is driven by the wish to reduce the security risks soldiers face in the battlefield and to boost infantry units’ combat ability. In the book, researchers and practitioners from various sectors are reviewing the current status of military UGV development and are analyzing the effectiveness of UGVs being used in support of infantry operations. The new book follows the publication of "Digital Infantry Battlefield Solution. Introduction to Ground Robotics" in 2016. The online version of the book is freely available at the Latvian Institute of International Affairs’ website.